Misery loves company but it won’t get mine- W.I.S.E. Project 2016 – Dancing in the rain! There are lessons I have learned in my life that I wish I had known much sooner. I guess we all have to put in the time and make the mistakes and then choose where to go from there. I know that my parents, especially my Mom, made a great effort to share her wisdom and lead me in the right direction, the straying from the path and believing I was right was all my doing. Another point for Mom. An important lesson that I finally learned is that as much as Misery loves company, it won’t be getting mine. Something inexplicably draws our young minds to drama and toxicity. Relationships and emotions are a funny thing, such a delicate balance between giving our support and taking the entire weight of others problems. Navigating this winding road of being a good mother, friend, co-worker and spouse but putting the right boundaries in place is essential to your well being and I hope you can figure it out quicker then I did. I won’t get into a long winded sermon about what you need to do because I am sure your Mom already told you and if you wouldn’t listen to her then why in the world would you listen to me. I will say this, relationships should not take more from you then they give, you are not responsible to carry the burden of stress that does not belong to you and it is okay to distance yourself from toxic people. You can support and encourage your loved ones without indulging in drama, negativity or carrying the entire weight of their world on your shoulders. 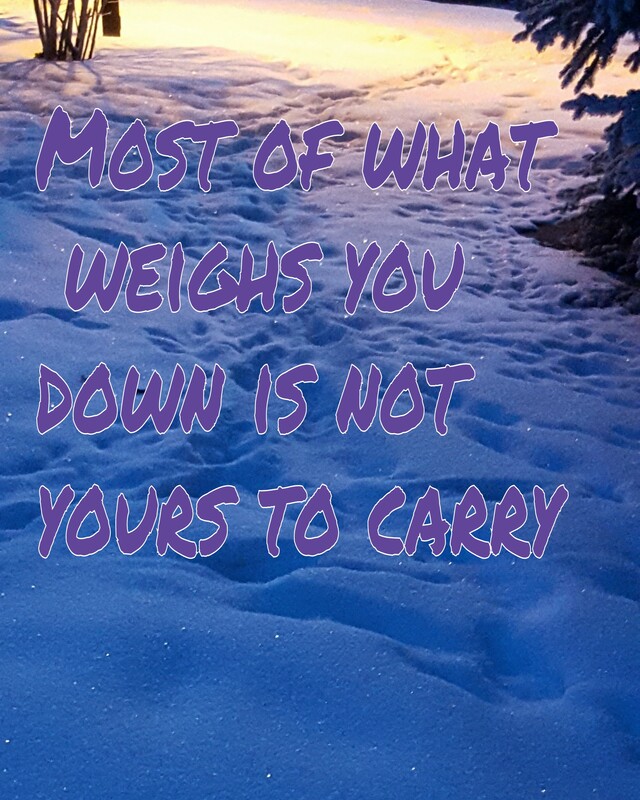 You can lighten the load that another carries just by being there for them. We are only ever expected to carry what we are able to, financially, spiritually and physically. At the end of the day, everyone is responsible to bear the weight of their burdens. Being mindful of this will allow you to lead a better life. Put yourself first because you are worthy! A wise friend just gave me a really good analogy. When the flight attendants are giving the pre-flight instructions prior to take-off they always instruct you to put on your oxygen mask first before assisting others. It is essential that you take care of you. If you do not, you will not be any good to others. You will find that the right people will remain in your life no matter what, even if they are not present everyday, you are in their thoughts and they quietly cheer you on from afar, just as you do them. “Everybody needs you, but you need you first, don’t help everyone and neglect yourself. Love your neighbor, as you love yourself, not instead of yourself. You are worth it! Be inspired, simplify and empower! Most of all be W.I.S.E.